K, L and I have fond memories of Edinburgh, as it is a lovely small city filled with many affordable yet sophisticated restaurants, one of them being The Witchery by the Castle. Situated by the Edinburgh Castle, The Witchery is an oasis of calm in the bustling tourist district. The restaurant is split into two dining rooms, one in the 16th-century building in Boswell’s Court, and the other in a 17th-century house off Sempill’s Court. The Witchery has a magical feeling to it – furnished in dark woods and leather, the archaic interior of the restaurant is lavish and theatrical. 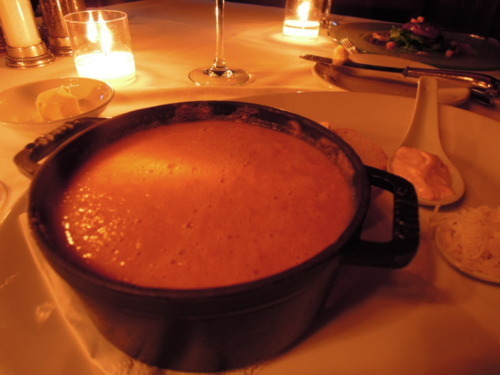 (1) The first course was the Witchery shellfish bisque, rouille, croutons and gruyere (£8.50). The soup’s taste was luxurious and natural, as it was packed with sea-fresh flavours from the shellfish, accentuated by the alluring richness of the gruyere cheese. 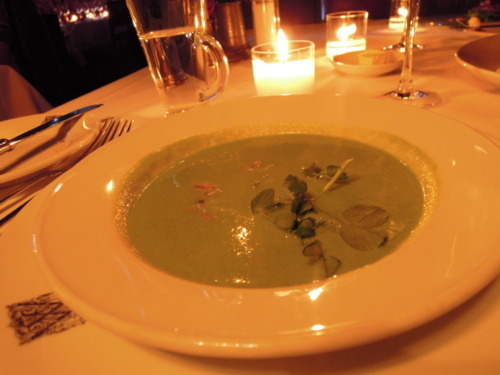 (2) The second course was a Pea and ham soup, which was creamy and brimming with fresh, delicious tastes; every spoon of it was well received. 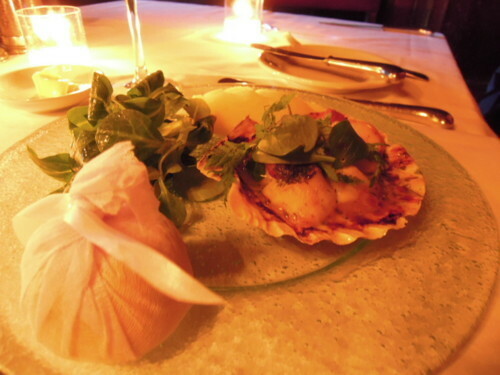 (3) The Guy Grieve’s scallops, herb-baked with smoked Iberico pancetta and garlic (£17) was an appetiser which showed off the restaurant’s culinary sophistication. The baked scallops were tender and juicy, while the pancetta added a perfect kick. 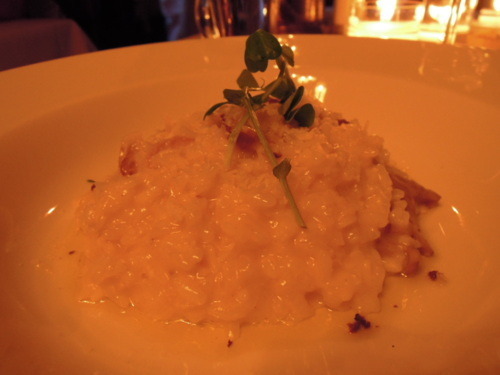 (4) The only weak course at our meal was the wild mushroom risotto, truffle oil. Even though the risotto had just the right consistency, it was in desperate need of more flavours. The taste of wild mushroom and truffle did not come through, resulting in an unacceptable blandness. (5) The waiter personally recommended the Three Little Pigs (£24.50), which was a trio of Slow-braised belly, roast loin and grilled shoulder bacon. The slow-braised belly melted like butter in the mouth, whereas the roast loin and grilled shoulder bacon had a gorgeous bite without being dry. The cider-glazed parsnips and the apple sauce offered a pleasant counterpoint to the delectable meaty flavours. 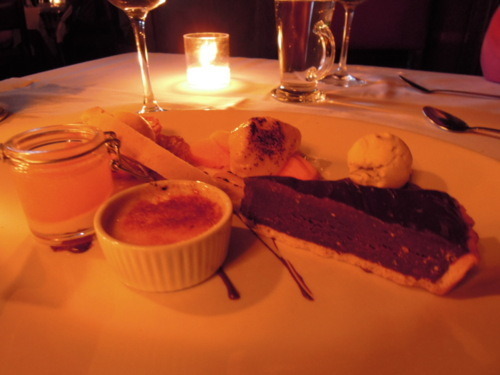 (6) Our spirits were immediately lifted by this Witchery pudding selection of Chocolate torte, passion fruit & mascarpone trifle, burnt Cambridge cream, exotic fruits and rum sabayon. Even though each component was scrumptious in its own way, the star of this platter was the chocolate torte, which was indulgently thick and rich and was permeated with a heavenly chocolate taste. 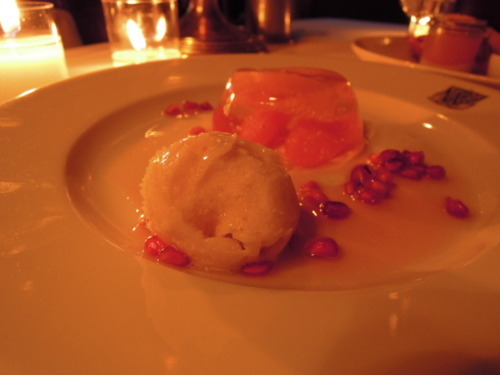 (7) Locals and tourists alike would enjoy the Citrus fruits in elderflower and perry jelly, white peach sorbet, mint and pomegranate salsa, which was a symphony of light, fruity flavours. The Citrus fruits in elderflower and perry jelly looked adorable and tasted refreshing, while the pomegranate salsa left something to munch on. 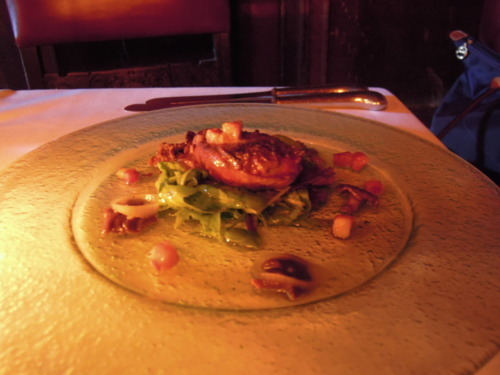 Conclusion: The Witchery is one beautiful and atmospheric restaurant; it is definitely a place to go if you visit Edinburgh, even if just for the Harry Potter-like experience.